Creole woman. Acc. # 1953.158.4. Watercolor on paper by Anna Maria von Phul, 1818. Missouri Historical Society Museum Collections. Von Phul 4. Scan © 2007, Missouri Historical Society. (between 1818-1823) were done by Anna Maria von Phul, an artist in her 30s, who came to St. Louis from Lexington, Kentucky. An unmarried woman, she came to visit her brother and lived with various family members in the area. 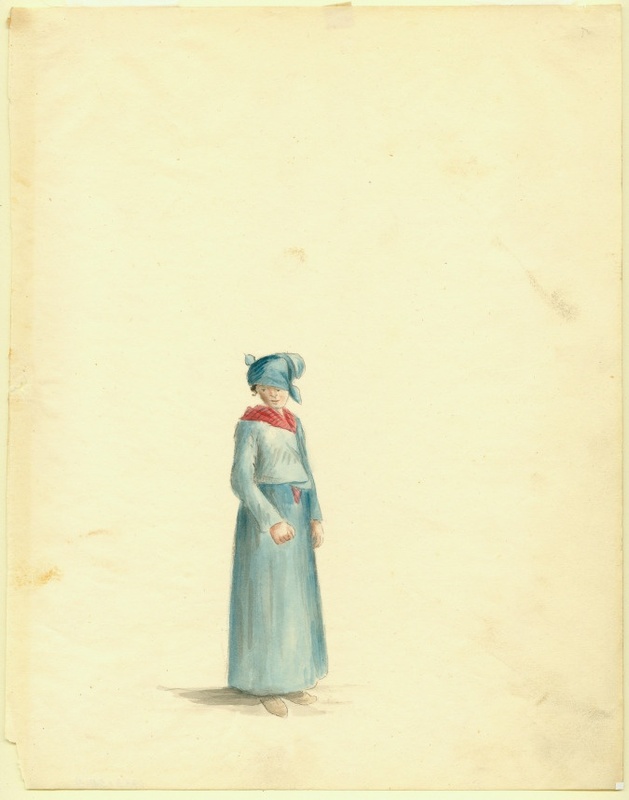 She filled sketchbooks with drawings and watercolor paintings of daily life in St. Louis, documenting clothing styles, transportation, architecture, and the variety of cultures in the area at the time. While her time in St. Louis was short (she died suddenly of a fever in 1823 when she was 37) the glimpse she gives into the city in the early 1800s is priceless. She passed at the home of her sister in Edwardsville, Illinois. I’m still searching for her burial site. View her artwork in the collection of the Missouri History Museum. Some of her letters exist at the Kentucky Historical Society. And at the Transylvania University Special Collections.